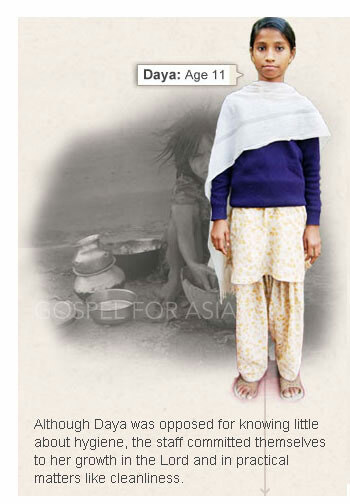 Daya was like an orphan even though her parents were not dead. They abandoned her and if it weren’t for her grandmother, she would have been completely alone. Family life was terrible for her. Her father beat her mother and then abandoned them both. Her mother deserted her. Neither parent showed her any love. There is nothing worse than a child not receiving parental love. Things didn’t improve for Daya. With no income, she and her grandmother were forced to beg at bus stops, train stations and shops. It’s heartbreaking to see an elderly woman, with her grandchild in her arms, begging for something to eat. The cook for a Gospel for Asia Bridge of Hope centre had to be cautious. He knew that there were beggars who carried small children in order to get larger handouts and they pocketed most of the money for themselves. He couldn’t tell if this beggar was on the level. He asked her a question and demanded an answer. Her response was to break down in tears and pour her heart out. He learned that the woman was the child’s grandmother and that Daya had once been a happy child until strife tore her family apart. Realizing that this woman was telling the truth and moved with compassion, the cook invited her to enroll Daya in the Bridge of Hope centre where he would cook the young girl meals. Daya joined the Bridge of Hope centre lodged between a railway station and a slum. Unfortunately, she stood out from the rest of the children. She was the poorest of the poor and living in the slums for much of her life, she didn’t know much about hygiene. She went to class each day in the same dirty clothes. She rarely had a bath and when she did, she didn’t use soap. It was not long before some of the parents began to complain about Daya and they pressured the Bridge of Hope staff to drop her from the program. They didn’t want this dirty child to be around their children. They threatened to remove their children from the centre if she didn’t leave. 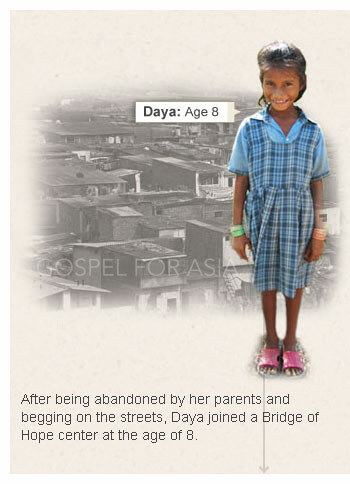 The Bridge of Hope staff remained committed to helping Daya because they knew that God had brought her to them. They decided to keep her in the program and undertook her hygiene problem. They scrubbed the 8 year old and gave her new clothes. By the time they were finished with Daya, you could hardly recognize her. They continued to teach her and her classmates proper hygiene and other practical life skills. These wonderful people of God didn’t cave into the demands of those parents who wanted them to expel Daya from the centre. They followed the example of the apostles Peter and John in Acts 5:29 who, when the council demanded to know why they were continuing to preach in Jesus’ name after being commanded not to, replied, “We ought to obey God rather than men.” They had to do whatever was necessary to protect the welfare of this child whom God had rescued from a life on the streets. Over six years have passed since Daya joined the Bridge of Hope centre. Instead of dirty rags, she is wearing beautiful dresses given as her uniforms. She had gone from being a beggar to being blessed. She had gone from the streets to a sanctuary where she receives an education. She is not in bonded labor or in a brothel. She is enjoying liberty in Jesus. She can realize her dream to be a teacher. 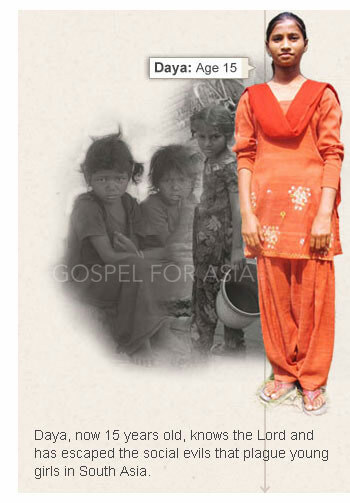 Daya, now 15 years old, has a relationship with a Father who loves her and a Savior who has given her hope and set her free from the social evils which plague young girls like her in South Asia. Daya’s grandmother has witnessed first hand the love of God as shown through the kindness of the Bridge of Hope staff. And she too is experiencing that love. God is using Bridge of Hope to change communities. More than 60,000 children are finding hope in Jesus through the centres but there are millions of children like Daya out there who are still living in despair. You can reach out to them by sponsoring a child. Find out what every Bridge of Hope child receives. My heart goes out to these children who are robbed of their childhood. They are unloved, abandoned, exploited and abused. I was touched by the story of Lakshmi, a nine year old who works in a factory rolling cigarettes. She is an example of selfless love. She doesn’t care about playing or going to school–all she wants is to bring her sister home from the bonded labor man. My sister is ten years old. Every morning at seven she goes to the bonded labor man, and every night at nine she comes home. He treats her badly; he hits her if he thinks she is working slowly or if she talks to the other children, he yells at her, he comes looking for her if she is sick and cannot go to work. I feel this is very difficult for her. It would cost 600 rupees to buy her sister’s freedom but for Lakshmi, there is hopeless. “We don’t have 600 rupees,” she says, “…we will never have 600 rupees.” 600 rupees is only $14.00 US. This is just one story among over 10 million stories of children who are bonded laborers in India. Help Bridge of Hope to bring hope to these children. Pray that God will rescue more of them from the clutches of evil people. Pray that they will discover that there is a loving God who sees their plight and will intervene. Pray that they will come to know Jesus.